The Annual Golden Pylon Awards spotlight true-grit traffic reporters whose on-air traffic talk keeps rush-hour commuters in the know about alternatives to solo driving. 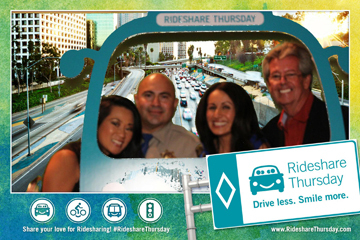 The awards are a prelude to California Rideshare Week from Oct. 7 – 11 when commuters are encouraged to share the ride. The Golden Pylon Awards are sponsored by five regional transportation agencies: Metro in Los Angeles County, Orange County Transportation Authority, Riverside County Transportation Commission, San Bernardino Associated Governments and Ventura County Transportation Commission. The coveted Golden Pylon Awards were handed out to the Southland’s top traffic reporters today. The awards honor the reporters who keep the region’s traffic moving by promoting rideshare options such as carpools, vanpools and public transportation. Nominated by their peers and the transit agencies, five traffic reporters who report on the daily traffic grind for numerous broadcast outlets won this year’s top honors. California Highway Patrol Officer Jose Barrios, reporting traffic conditions on FOX 11, Univision 34, Telemundo 52, Radio Mexico and KFRN-Family. Ginger Chan, transit savvy traffic reporter for KTLA-TV and 102.7 KIIS-FM. Jeff Baugh, assisting the public in finding better commuting options on KNX 1070. Mike O’Brien, bringing up-to-the-minute traffic info on KNX 1070. Sabina Mora, helping the public “Beat the Traffic” on KHHT, KFSH, KRLA, KKLA. The Golden Pylon Awards are a traditional prelude to California Rideshare Week, which begins Monday, October 7. Rideshare Week is a statewide campaign to encourage thousands of commuters to ‘share the ride’ to help reduce traffic and air pollution. The statewide event provides employers with a great opportunity to raise awareness about the importance of sharing the ride in California. Ridesharing helps employees get to work on time, has increased job performance, retention and morale and it contributes to cleaner air. Sponsored by Southland businesses and organizations, employees are encouraged to call 511 or to register online and pledge to rideshare at least once during Rideshare Week October 7-11. Commuters who pledge are eligible to win gift cards and other valuable prizes.